I’m a huge online shopper, much to my husband’s chagrin. I love the convenience of it. Especially when it comes to purchasing clothes for Sweet Girl. I know her size, I know what she needs. Why would I lug myself (and potentially herself) down to the mall when I can buy what she needs in under 2 minutes. For this reason, I shop at Old Navy a lot. They email me deals almost every week and they have a great selection to choose from. But I’m funked out at Old Navy, and here’s why. The other day I clicked the Halloween costume section of their website and the first thing I noticed wasn’t the cute costumes. It was how Old Navy divided the costumes up. 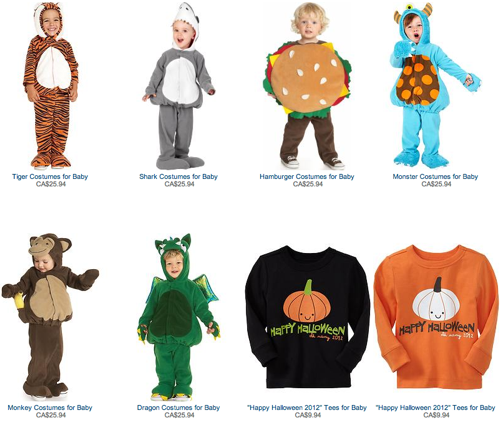 Why does Old Navy divide toddler Halloween costumes by gender? Now I get it. This is an e-commerce site. Merchandise is organized to help me shop. Help me click Add to Checkout that much faster. But is it really necessary to organize toddler Halloween costumes by gender? Really? C’mon Old Navy. Of course, if Sweet Girl wants to be a shark for Halloween, there’s nothing stopping her. Same goes if a little boy out there decides he can rock a bumblebee costume like nobody’s business. What I don’t like is the implied gender divide this boy-girl categorization makes. It niggles at me. It feels wrong. So I tweeted about it. 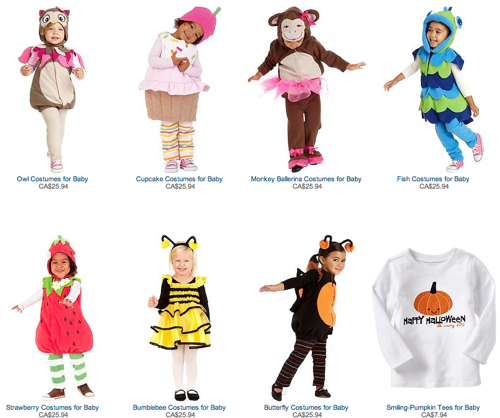 why does Old Navy divide toddler Halloween costumes by gender? so boys can be tigers, sharks, robots but girls cupcakes & bumblebees etc? Kamerine (aka @lifeofk) pointed me to a post by @naturalurbanmom where she asks the same thing (it’s actually a follow up to an earlier post on this same subject). And then coincidentally, I read a post by @Karen_C_Wilson where she talks about the reaction she got on Facebook when she shared a photo of her boy dressed up in a princess costume (he rocked it of course). A little confession here…I remember when Karen posted that photo to Facebook. I was uncomfortable when I first saw it. I forced myself to consciously recognize and process that feeling. I then discarded it as utter bull. If I want to defend my daughter’s choice to dress up as a monster or play with a firetruck, who am I to be uncomfortable with a boy exploring his own interests too? We should be encouraging children to go ahead and play. To have fun. Sure there are gender differences. I’m not discounting that fact. However, it’s not something that needs to be defined by a Halloween costume. Or dressup fun. Or play in general. By defining toys and costumes as “boy” or “girl”, we make play – we make selecting a Halloween costume – a gender decision. And that’s the silliest thing ever. The whole gender thing drives me crazy. Why can’t my boys have a doll house? Why do all the doll houses at Target have to be pink? Why can’t it just look like a normal house. Why do they have to make pink tools or legos? Can girls only be interested in those things if they are pink? CRAZY I tell you! One of our old play therapists thinks I would make tons of money making normal gender neutral toys for all kids. They already exist…they just cost more! My boys regularly choose pink as their favorite color. One of them proudly wore a lavender teddy bear ring and then a bright purple heart ring he received as a reward at therapy. They both think it is so funny to put on mommy’s heels and carry a purse around the house. The thing is. I totally don’t care. The are only 4 (almost). I am glad my husband doesn’t care either. There are those that do care and are bothered by it in our lives. I have kindly told them all not to worry so much! Anyway….sorry for the long comment! I just totally feel you on this whole gender issue with little kids! Ginger, rant away! I agree with you completely. Most of Sweet Girls toys – that are pink or purple – were gifted to her from friends and family. To balance it out, DH and I try to incorporate other colours of the rainbow into her play. We did end up getting a dollhouse for her from Toys R Us that has a pink roof and pink stairs BUT at least the furniture are different colours (blue, orange, yellow, etc.). She plays with her dolls a lot. Nothing we actively encouraged or discouraged…something she naturally (I guess?) migrated too. But she also has a firetruck she likes to play with (and a firefighter hat she likes to wear). I completely agree, Katie just wrote a post about almost the exact same issue she has with Lego! We must all be on the same wave length! Sherrie – it’s just so weird to see the gender play still so pervasive. This is such an important post (and not just because it reminds me how freaking early stores start selling Halloween stuff). We all have a mindset we NEED to acknowledge, test, and ultimately reject about gender roles. This is as good a place to start as any. Thanks for posting it. Thanks Amy. I feel it’s important to point this weird need to boy-girl toys, clothes, etc. I wonder if the brands will listen? Maybe we parents need to shout louder. Yay, Mel! Way to call it like it should be. This separation of costumes seems to completely defeat the whole point of learning to make-believe. In the land of make believe you can be anything or dress any way that you want. I’m sure Old Navy isn’t the only retailer who has forgotten how make believe and costumes work. Karen so true. Learning to make-believe should be all about exploration and discovery…obviously this genderizing (new word) of children’s toys/costumes/clothes, etc has hit a nerve. I’ve read several different articles in the past couple of weeks where parents share their own experiences with it. And the joy of simply letting their children make-believe (and be!) the way their children want to.